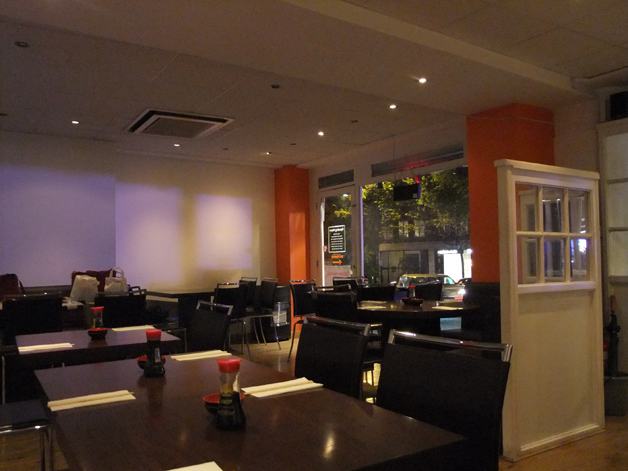 Ten Ten Tei is my favourite budget Japanese restaurant in London, but that restaurant is located in the West End. Although I’ll willingly travel far and wide for a good meal, not everyone feels the same way. London is a big city after all and not everyone will have the time or the energy to trek into the centre of town just because they’re in the mood for sushi. I therefore made my way to Koi, a small Japanese restaurant in Finchley, a part of north London I’d never been to before, with Bleeding Gums Murphy in tow. Calling Koi a restaurant is stretching the truth a little though. Although there are at least a dozen or so tables, the establishment’s focus is firmly on take away and delivery orders with just the proprietor manning the front of the house by himself. Despite being rushed off his feet much of the time, he was polite and friendly and seemed to know his regulars on sight and by name. Not related to the Koi restaurant in Knightsbridge. Obviously. As a sop to Bleeding Gum Murphy’s desire to fulfil one of his five-a-day we started off with the sumi salad. Although allegedly a Japanese-style salad, I have my doubts – the limp lettuce leaves, carrot and radish shavings not only seem Western rather than Japanese, but were rather limp and drab too. 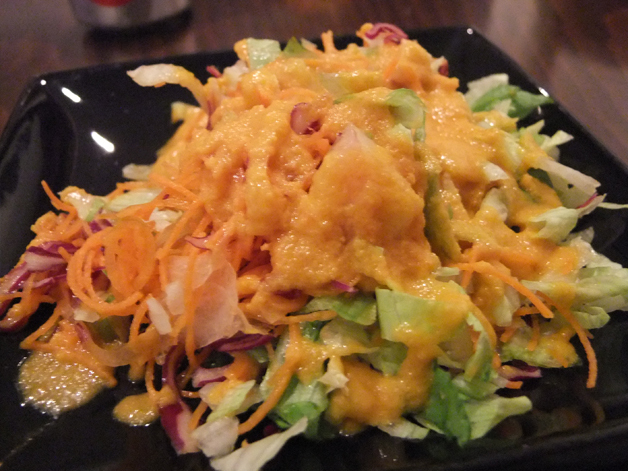 The suitably fruity carrot and apple dressing was the sumi salad’s sole saving grace. Apple and carrot dressing on a salad. It would've worked if it wasn't for the salad. 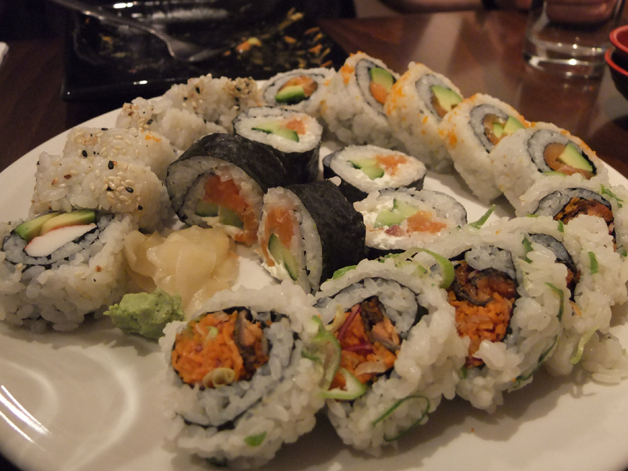 The main bulk of our meal was made up by the maki rolls and the uramaki rolls. Maki rolls have their nori (sheets of seaweed) wrapped around the outside of the rice. 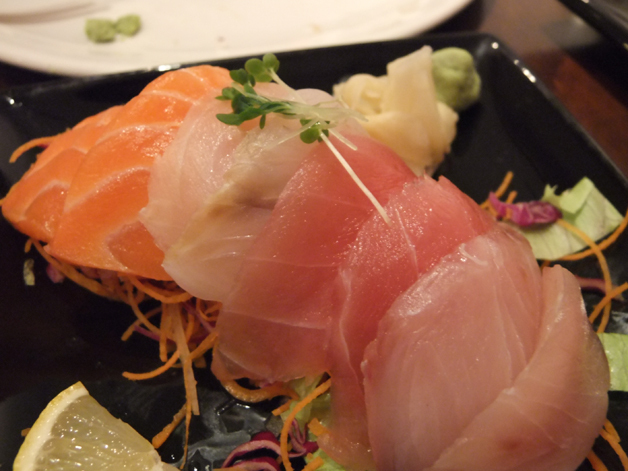 The salmon, tuna and cucumber fillings here were tasty and fresh enough. Uramaki rolls on the other hand tend to have the nori wrapped around the inside of the rice roll and tend to have two fillings rather than just one. 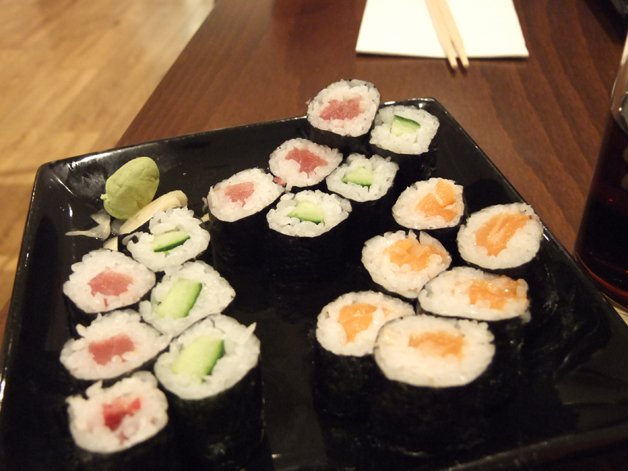 The salmon and avocado creams were suitably creamy, although the salmon skin rolls were nowhere to be found and seemed to have been replaced by avocado and surimi crab stick rolls – the very definition of cheap filler. The smoked salmon and cream cheese rolls were too westernised for my tastes and too similar to the California rolls, but Bleeding Gums Murphy enjoyed them both nonetheless. Salmon and cream cheese? Ridiculous. Although Bleeding Gums Murphy seemed satiated by the offering of rice and cheap filler, I decided to order a couple of other dishes. I wasn’t expecting much from the sashimi platter of seabass, salmon and tuna, but apart from the rather bland tuna, the slices of raw fish were surprisingly fresh and flavoursome. There's a giant bed of shredded vegetables underneath the sashimi. No, you can't trade them for more raw fish. 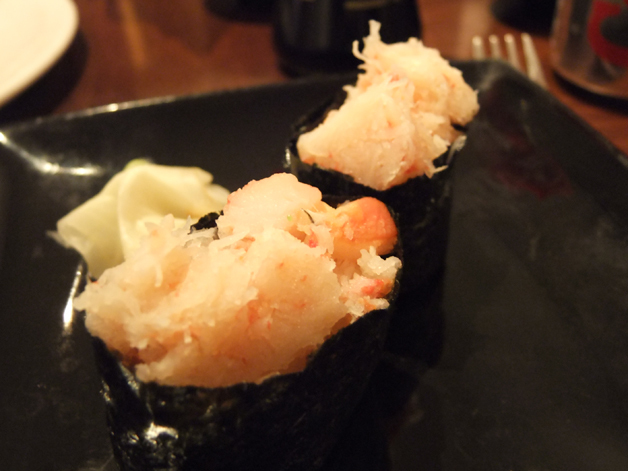 Gunkan rolls are a little tricky to pull off since they usually consist of nori filled with soft, delicate fillings. Sadly the crab gunkan at Koi left much to be desired – the cheap head meat was bland and had probably seen the inside of a freezer shortly before it made its way to my table. Bleeding Gums Murphy settled for a Tsingtao beer, while I washed my meal down with a bottle of pomegranate green tea although it didn’t taste much like pomegranate or tea. Although Bleeding Gums Murphy seemed pleased with his meal at Koi, I had very mixed feelings so I decided to go back on my own, this time to try some of the other dishes on the large, expansive menu. Japanese food may be best known for raw dishes such as sushi and sashimi, but there are plenty of cooked dishes available too. 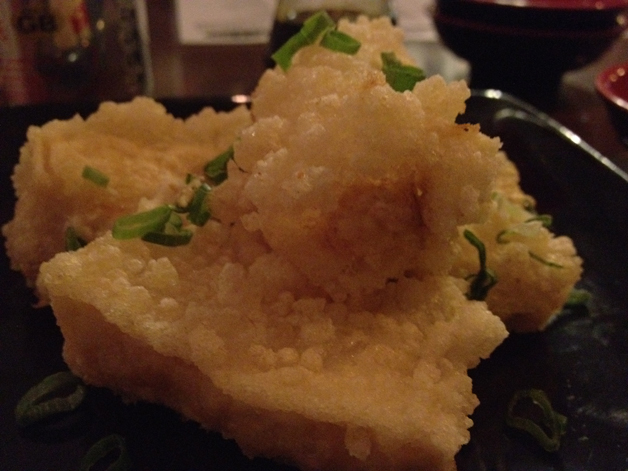 I started off with one of my favourite Japanese dishes, agedashi tofu. Sadly, Koi’s version is mildly deformed. What should be a light, thin and silky deep fried exterior is instead an incredibly thick, stodgy batter studded with air bubbles. The dipping sauce, which should be a gentle blend of soy sauce, dashi and mirin, is rendered here as a crude mixture of dark, heavy soy sauce and vinegar which makes the batter soggy and goopy. The tofu is overwhelmed by it all and doesn’t have the silky texture it should have either. Very poor. The worst agedashi tofu I have ever tasted. The agedashi tofu was a disaster, but I had hopes the chicken katsu curry would be an improvement. 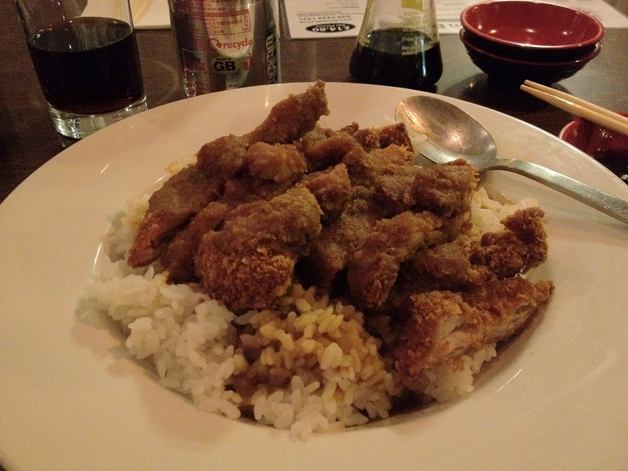 Like the tofu, the katsu curry is is generously sized. Unfortunately like the tofu, the curry isn’t very good. The strips of chicken were limp and watery and the breaded exterior was soft, lacking the crispiness that I would expect. Most oddly of all was the sauce, or rather the lack of it. A vague smattering of curry-flavoured stains clung to the meat, rather than the thick lashings of gravy I was expecting. This wouldn’t have been so bad if the sauce had actually tasted of something other then vague artificial curry flavour. No skilful mix of sweet, starchy and spicy flavours here. The worst chicken katsu curry I've ever tasted. Given the hard working charm of Koi’s proprietor, it gives me no joy to criticise Koi for the unbalanced quality of its food. The cooked dishes are appallingly bad and should be avoided. While the sashimi and sushi range from good to reasonably good, they’re only worth bothering with if you really can’t be arsed to go somewhere better. Opening Hours: Monday 17.00-23.00; Tuesday-Friday 11.00-14.30, 17.00-23.00; Saturday-Sunday 11.00-23.00. Total cost for one person including drinks: £15-30 approx. 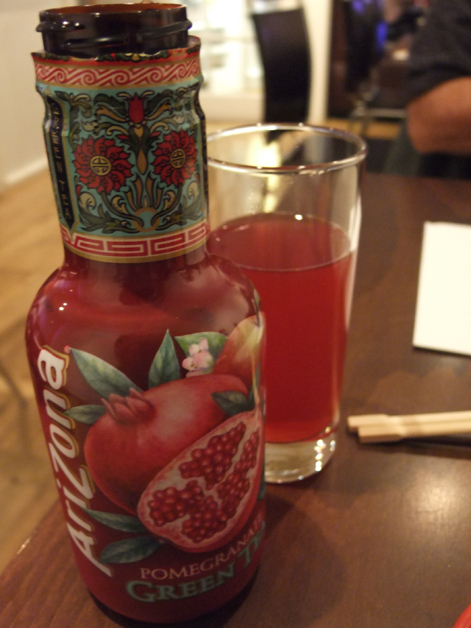 Tags: curry, finchley, green tea, gunkan, katsu, koi, london, maki, restaurant, review, salad, sashimi, sushi, tofu, uramaki. Bookmark the permalink. Previous post ← Fino review – tapas legend or tapas has-been?